Walter Hartright has got the job as a drawing master to two young girls, Ms. Laura Fairlie and her half-sister, Marion Halcombe. On his way there, he helps a woman dressed in white to escape from her followers. When he finally met Laura, he is struck by how she looks like the Woman in White. He (as all good heroes) falls in love with Laura, but she is engaged to Sir Percival Glyde and decides to marry him. Sir Percival Glyde is a terrible man with a terrible plan along with his Italian accomplice Count Fosco. The book is narrated by the person who has most insight at that time, and the best is that the narrations are different. I was laughing hard when reading Laura’s hypochondriac uncle’s narrative. Based on the cover and the title I thought this would be a ghost story, but instead it is one of the first sensations novel; a mix of Gothic literature and the psychological realism of the domestic novel. It is also said to be one of the first crime novels. It is entertaining, as all Gothic novels are, and one can write pages about the female portraits. Marion is the smart spinster, completely devoted to her Laura. And Laura is the stereotypical weak blonde who cannot see danger when it’s in her face. But Count Fosco is definitely my favourite character, despite being the villain. 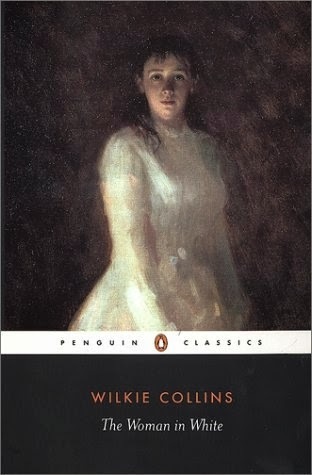 I think it’s a tie between the Moonstone and the Woman in White as my favourite Wilkie Collins novel. I just downloaded about 7 more of his works to my Kindle and I hope they are as good as his famous works. 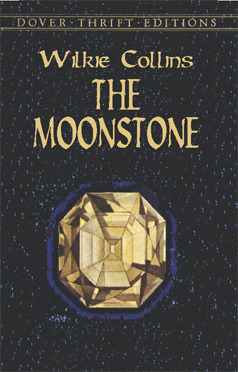 Rachel is given an enormous diamond, named the Moonstone, on her birthday, inherited from her uncle. The diamond was originally stolen from an Indian shrine and there are three suspicious looking Indians in the neighbourhood. And then on the night after the birthday bash, the diamond is nowhere to be found and the police is called in. The police is quick to discover that it must have been an inside job, and then the eminent police detective Sergeant Cuff, with a very peculiar interest for roses, is put on the case. He soon realises that a servant girl, Rosanna, along with Rachel, are hiding something about the case. The Moonstone is said to be the first detective mystery and I absolutely loved it. It has the perfect whodunnit-plot and so many twists and turns. I really liked how it had different narrators with some very interesting personalities, depending on where the diamond was believed to be. The characters are also interesting, although Rachel really annoyed me with her behaviour, but I guess that was how girls in the 1800s were supposed to act. I especially loved the steward and main narrator (at least in my eyes), Gabriel Betteredge, and his love and use of Robinson Crusoe. I definitely need to read that one soon. And I’d never thought that opium would be used to solve a case. I loved it. This was April’s book in Line’s 1001 books challenge. To see what other Norwegians have said about it, go here.